This is an incredible achievement in learning. At the age of 95, Kansas resident Nola Ochs is now the world's oldest college graduate. Nola Ochs also has broken a Guinness World Record, although she never intended to do so. The previous Guinness Record belongs to Mozelle Richardson, who at age 90 in 2004 received a journalism degree from the University of Oklahoma. Ochs received her bachelor's degree in general studies and history during Saturday's graduation ceremony at Fort Hays State University. Ochs is the proud matriarch of a family that includes three sons — a fourth died in 1995 — along with 13 grandchildren and 15 great grandchildren. Nola Ochs who majored in history brought an interesting perspective to her Soviet Union course. She recalls when the Berlin Wall was torn down. She also remembers the days before the Soviet Union was formed in 1917. 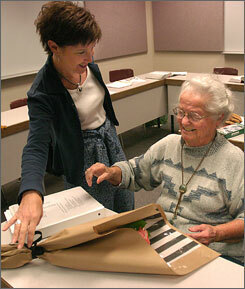 She started taking classes occasionally at Dodge City Community College after the 1972 death of her husband of 39 years. She wanted to complete her studies and be productive. Apperaring in NBC's the Tonight Show with Jay Leno, she came in as the second guest of the show after Simon Cowell, the blunt-talking American Idol judge. She said she has never heard about Simon and never watched the Idol. She said she grew up on a farm where raising children was the most imortant duty. After graduation, she has applied for a job and has received two responses. She is looking forward to serve on a cruise ship and go around the world as a storyteller.